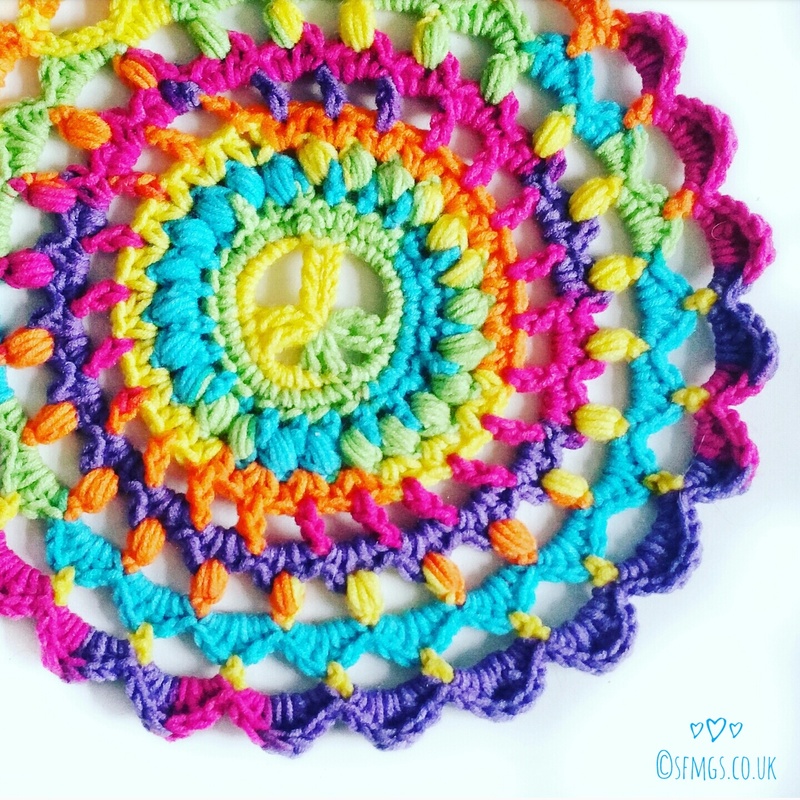 Crochet this fun, bright mandala using a combination of easy traditional crochet stitches mixed with puff stitches in a variegated yarn with this week's free crochet mandala pattern. 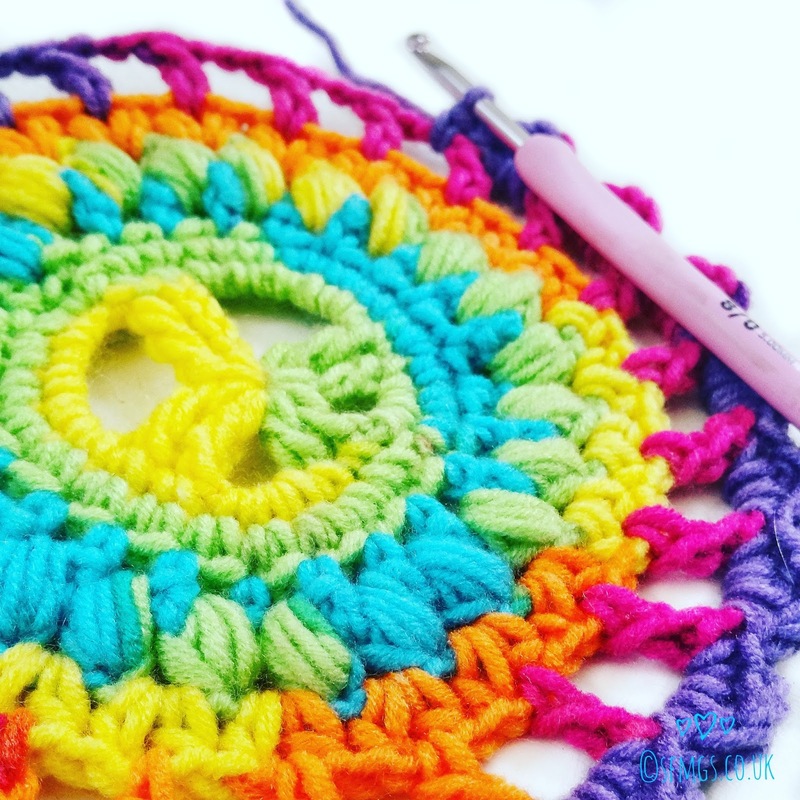 For this week's free mandala pattern, I thought it would be fun to use a bright variegated yarn to create a cool tie-dye effect and a piece that works up nice and fast with only 2 ends to weave/sew in! Yay! 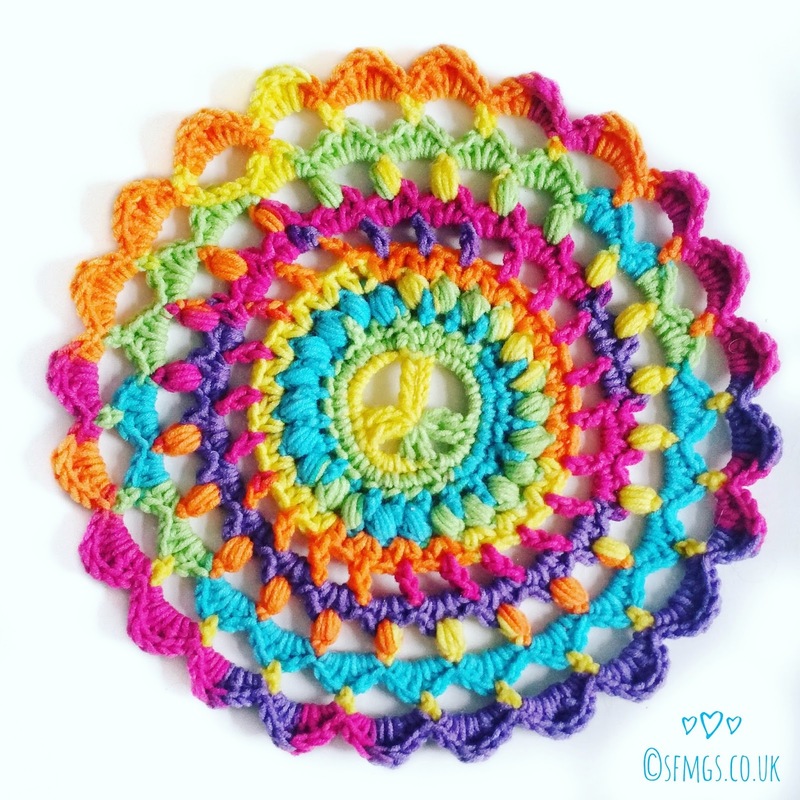 Made using this lush James C Brett Partytime yarn from +Hobbycraft, the colour changes are so vibrant! It's such a nice yarn to work with with a smooth even finish. This yarn is a lighter weight chunky and with a 5mm hook, the finished mandala measures approx 12in in diameter. puff stitch = to make a puff stitch, (yarn over hook, insert, pull through to the height of tc) 4 times into one st sp or ch sp to give 7 loops on the hook plus your original ch. To finish the stitch, yarn over hook and pull through all loops. Secure with ss. If you want to make different coloured rounds, at the end of each yarn join with ss and rejoin yarn in lieu off ss into 'x'. R1: Magic loop, ch5 as 1st ttc. (ttc, ch5, 2dtc, ch2, 2tc, ch2, 2dtc, ch5) into the loop. Tighten and join with ss. R2: ss into ch-5 sp. Ch1 as 1st dc. (5dc) into ch-5 sp, 2dc. [(3dc) into ch-2 sp, 2dc] twice. R3: ch1 as 1st dc. Dc into same st sp. Rpt [(2dc)] in each st sp to end. Join with ss. R4: Ch4 as 1st dc plus ch3. Miss 1 st sp. Repeat [dc, ch3] in every other st sp to end. Join with ss. R5: ss into ch-3 sp. Ch2 and make puff st into same ch-3 sp. Ch1. Rpt [puff st, ch1] into each ch-3 sp to end. Join with ss. R6: ss to ch-1 sp. Ch3 as 1st htc plus ch1. Htc into same ch-1 sp. Rpt [(htc, ch1, htc)] in each ch-1 sp to end. Join with ss. R7: ss to ch-1 sp. Ch6 as 1st tc plus ch3. Rpt [tc, ch3] in each ch-1 sp to end. Join with ss. R8: ss into ch-3 sp. Ch1 as 1st dc. (tc, ch1, tc, dc) into same ch-3 sp. Rpt [(dc, tc, ch1, tc, dc)] in each ch-3 sp to end.Join with ss. R9: ss into ch-1 sp. Ch2, puff st into same ch-1 sp, ch4. Rpt [puff st, ch4] in each ch-1 sp to end. Join with ss. R10: ss into ch-4 sp. Ch1 as 1st dc. (htc, 2tc, htc, dc) into same ch-4 sp. Rpt [(dc, htc, 2tc, htc, dc)] in each ch-4 sp to end. Join with ss. Rpt [dc, ch6, miss 5 st sp] to end. Join with ss. R12: ss into ch-6 sp. Ch1 as 1st dc. (tc, 2dtc, tc, dc) into same ch-6 sp. Rpt [(dc, tc, 2dtc, tc, dc)] each ch-6 sp to end. Join with ss and FO. Why not try some of my other free mandala patterns? Click here!